This mount have suction cup and the glue sticky pad( which can be reused)for double griped so that it’s able to be used on rough surface . If it’s not sticky enough, just wash it by water, and it will recover sticky after natural drying, and there’s one lock thread to grip after installation. Our seller warranty guarantees that your purchase is 100% risk-free. If for some reason your purchase doesn’t work or you are satisified with the products, We supply best service. We are committed to 100% satisfaction for our customers. If you have any problems, please feel free to email us. We will fulfill your request promptly, hassle-free. Suction cup and sticky pad(which can be reused)for double griping. if it’s not sticky enough, just wash it by water, it will recover sticky after drying. 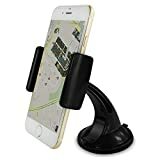 ease one touch car mount to mount on windshield, dashboard and other smooth or textured surface with suction installation.